It was difficult not to cry watching 159 future doctors don the trademark jacket and instrument of their profession Sunday at the White Coat ceremony of the Edward Via College of Osteopathic Medicine, VCOM, in Spartanburg, South Carolina. Not just because each of these men and women represent the hope of multiple generations, along with dreams and values shaped the world over. But especially because one of those who took the stage to embrace the moment of his formal induction into medical school was my son. 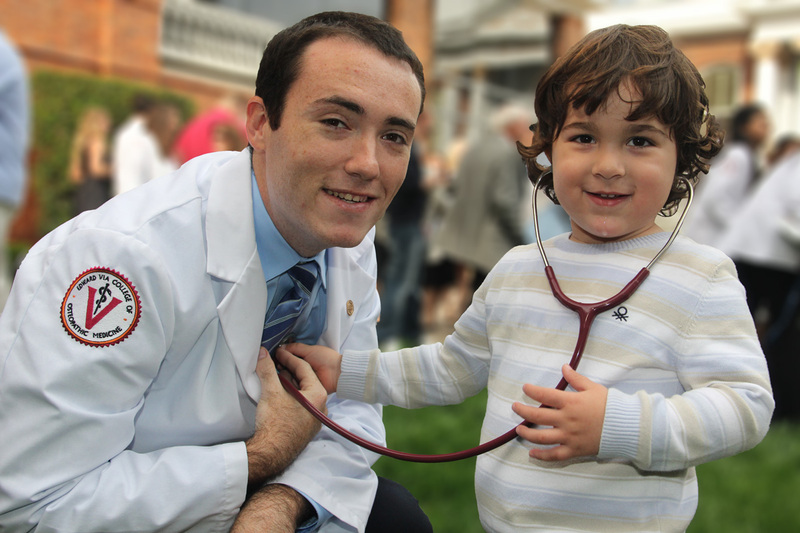 Alexander Joshua Eisenberg, 23, a first year medical student at the Edward Via College of Osteopathic Medicine (VCOM), with his three-year-old brother at VCOM’s Class of 2016 White Coat ceremony . Looking at many of the other 1,000+ relatives who filled the Twichell Auditorium secluded beneath towering, ancient oaks within the serene wooded landscape of nearby Converse College for the annual White Coat ceremony, I quickly saw I wasn’t the only parent whose eyes revealed tears of pride and gratitude as the children we raised, cheered and prayed for from the first moments of their lives stepped forward to accept the solemn oath and obligations of their chosen profession. As a father witnessing this milestone in my oldest son’s long-standing passion, determination and dedication to becoming a physician, I wondered to myself how much our family shared in common with the families of each of the other future doctors at the White Coat ceremony. Despite all the challenges of our lives, our children grew up knowing they had the resources within them to realize their most cherished dreams; they learned early in life about the difference one person could make in the lives of others; they came to understand the opportunities that became possible through hard work, believing in themselves, and surrounding themselves with others who strived to pursue similar values and aspirations. Perhaps most important, they always knew their parents believed in them and their ability to fulfill the potential and promise of their lives. For 23 years, I’ve known that Alex could be and do whatever he chose. On Sunday, for Alex and each of his peers at the Edward Via College of Osteopathic Medicine, it was evident they knew that too. VCOM President James F. Wolfe, Ph.D., right, with Alex Eisenberg at Class of 2016 White Coat ceremony.